Camp Fig Tree is a remote, private lodge set on top of the stunning Zuurberg mountain range near Addo. Resting in a 35 000 ha conservancy, the camp boasts breathtaking 270-degree views over the verdant surrounding areas and out onto the steely-blue Indian Ocean. Camp Fig Tree has been designed in the traditional 1920's colonial building style. Historically, this includes the distinctive use of corrugated iron roofing and wide, sweeping verandas. The lounge and dining room are intoxicatingly evocative of the romantic colonial era. Large, old, sash windows frame the views outside while the spacious verandas provide areas for relaxed sociability. The Camp's public areas include a swimming pool with slatted deck overlooking the valley falling off sharply to the side. The valley's largely Afro mountain forests are filled with luxurious Tsitsikamma Yellowwood, Wild Olive and Stinkwood trees. Each room, with bathroom en suite, is individually decorated with its own veranda and private views. From an open Land Rover in their park, you are likely to see wildlife such as Kudu, Bushbuck, Leopard, Caracal, Bush Pig and Jackal. Additionally, a trip into the neighboring Addo National Park, a mere 15 minutes away, affords guests outstanding opportunities for viewing Elephant. 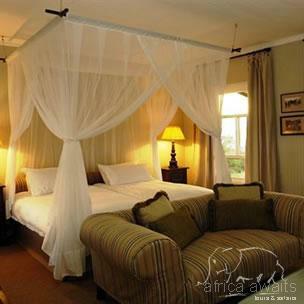 International guests will find comfort in knowing the entire region is malaria free. Evenings are spent in traditional African style around a unique "boma" with the sounds of the crackling fire and night noises drifting up from the lush valley below. Camp Figtree offers a number of leisure activities that can be easily tailored to suit individual needs. 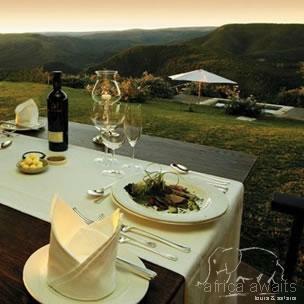 Amongst these are visits to the Shamwari Game Reserve, night-time Tooth and Claw Safaris with Schotia, Ballooning Trips, Picnics (in outdoor colonial style), Historical Tours of the famous Sundays River Valley and Guided Horseback and Elephant Back Safaris nearby. 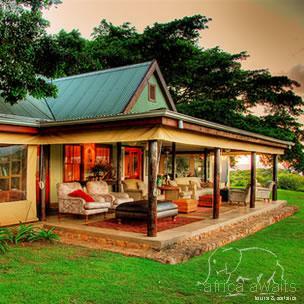 With your holiday, safari or business trip from in to Camp Fig Tree in Eastern Cape.